Chad Mayes (born April 23, 1977) is an American politician currently serving in the California State Assembly. He is a Republican representing the 42nd district, encompassing parts of Riverside and San Bernardino counties. Prior to being elected to the State Assembly, he was a Yucca Valley City Councilman. Mayes earned a Bachelor of Science in Government from Liberty University. Before entering public service, Mayes worked as a financial advisor and tax preparer. The son of a pastor, Mayes grew up in Yucca Valley, graduating from Grace Christian School at 16. After graduating from Liberty University, Mayes married his wife Shanon at 24. In July 2017, a web site called American Children First claimed that Mayes had been having an affair with Olsen, his predecessor as Assembly Republican Leader, who is also the Vice Chair of the California Republican Party and an elected member of the Stanislaus County Board of Supervisors. It was revealed that Olsen's husband had sent a letter to the office of Assembly Speaker Anthony Rendon requesting a formal investigation into whether or not the pair has used taxpayer resources and staff time to carry out and/or conceal the extramarital affair. Mayes served on the Yucca Valley Town Council from 2002–2011, and was twice elected by the council to serve as mayor. In 2004, Mayes and then-councilman Paul Cook voted against a proposed 42-percent pay increase for town elected officials. In his final budget as Mayor, Yucca Valley spent $8.7 million, a slight decrease from the previous year, and had over $5 million in reserves. 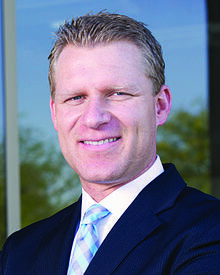 In 2011, Mayes resigned as a member of the town council to focus on his responsibilities as Chief of Staff to San Bernardino County Supervisor Janice Rutherford, saying he found it "difficult to keep up with the basics of serving as a council member," and that "Yucca Valley deserves a council member who will give them 100 percent every day." In 2014, Mayes ran for the California State Assembly to succeed term-limited Republican Brian Nestande, who ran unsuccessfully for Congress that year. Mayes was elected to the State Assembly in November 2014, with 57.3% of the vote. He was appointed Vice Chair of the Assembly Human Services Committee and a member of the Committees on Governmental Organization, Insurance and Rules, as well as the Special Committee on Legislative Ethics. Mayes was also appointed to the Select Committee on Renewable Energy Development and Restoration of the Salton Sea, and was named Chief Republican Whip. Mayes was appointed by Assembly Speaker Toni Atkins to serve on the California Commission on Disability Access, which works to improve accessibility by fostering dialogue between the disabled and business communities. During his first year in office, he introduced AB 851, which provides an orderly process for municipal disincorporation, AB 1286, which would create a body to holistically examine the state's regulatory environment, and AB 1202, which would have reduced the California State Fire Prevention Fee for residents who also pay for fire prevention at the local level. All three bills received unanimous bi-partisan support in their policy committee hearings. Mayes has angered many Californian Republicans in other ways. In May 2017, the California Family Council criticized him for posting a tweet that endorsed Harvey Milk Day. In July 2017, Mayes led a handful of Republicans in the State Assembly to vote with the Democratic majority in favor of AB 398, which extended the state's climate change program – colloquially referred to as “cap-and-trade” – for an additional 13 years. Mayes, along with six other Assembly Republicans and one Republican in the State Senate, voted for the bill alongside almost all of the Democrats in both chambers, and Governor Jerry Brown signed the bill into law. The effort was viewed by conservative activists as a vote in favor of more government regulations and increased taxes, and after multiple county parties officially called on Mayes to step down as Assembly Minority Leader, the state board of the California Republican Party did the same. On August 24, the Republican caucus announced the removal of Mayes as the Minority Leader, and he was succeeded by Brian Dahle on September 15. ^ "Alumnus serves in California Assembly". Archived from the original on 2015-09-10. ^ a b "[Chad Mayes] Biography". Retrieved 29 July 2015. ^ Vaughn, Courtney. "Yucca Valley native looks to state assembly". Retrieved 29 July 2015. ^ Turner, Joseph (July 17, 2017). ""Never Trump" California GOP Leader Chad Mayes Having Affair with Colleague". American Children First. Retrieved August 9, 2017. ^ Olsen, Rod (April 24, 2017). "Letter from Rod Olsen to Speaker Anthony Rendon's Office" (PDF). American Children First. Retrieved August 9, 2017. ^ Koseff, Alexei (July 18, 2017). "Alleged affair between California Assembly Republican leaders fuels political attack". Sacramento Bee. Retrieved August 9, 2017. ^ Kelly, Jim. "Compensation equals consternation for council". Hi-Desert Star. Retrieved 29 July 2015. ^ "Town of Yucca Valley: Adopted Budget 2010-2011" (PDF). ^ Unger, Rebecca. "Mayes resigns from town council". Hi-Desert Star. Retrieved 29 July 2015. ^ Newkirk, Barrett. "Chad Mayes announces Assembly committees". The Desert Sun. Retrieved 29 July 2015. ^ "Members of the Select Committee on Renewable Energy Development and Restoration of the Salton Sea". ^ "Assembly Republican Members". Archived from the original on 6 September 2015. Retrieved 29 July 2015. ^ "Asm. Chad Mayes on Twitter". Twitter. ^ "Republicans' gay rights tweet upsets California Family Council". 30 May 2017. Retrieved 6 June 2018. ^ Melanie Mason and Chris Megerian (July 17, 2017). "California Legislature extends state's cap-and-trade program in rare bipartisan effort to address climate change". Los Angeles Times. Retrieved June 2, 2018. ^ Patrick McGreevy (August 24, 2017). "He rallied support for California's climate change fight. Now Chad Mays is out as Assembly Republican leader". Los Angeles Times. Retrieved June 2, 2018. ^ Horseman, Jeff (August 24, 2017). "Republicans oust Inland Assemblyman Chad Mayes as GOP leader". The Press-Enterprise. Retrieved August 24, 2017. ^ Jeff Horseman (January 9, 2018). "Chad Mayes forms "New Way California" to change the California GOP's message". Press Enterprise. Retrieved June 2, 2018. ^ Alexei Koseff (January 9, 2018). "Schwarzenegger joins New Way campaign for CA GOP". Sacramento Bee. Retrieved June 2, 2018. ^ New Way California. "New Way Summit Agenda". Twitter. ^ Javier Panzar (March 22, 2018). "Schwarzenegger and Kasich back Republicans looking for a 'new way' for California's party". Los Angeles Times. Retrieved June 2, 2018.